The future of cars as projected by my youth—when carmakers would get serious about hydrogen, when electric cars would be mainstream, when cars would drive themselves—is now more realized than ever. It’s weird how normal the whole thing is. I don’t know how many times I heard that hydrogen was the next big thing in the car world. It’s the most plentiful element in existence! It’s a wonderfuel! This is the future! And year after year, the message never changed, no matter how much money got thrown at the problems of cost and distribution. Daimler AG head Dieter Zetsche said at an automotive summit in Germany this week that hydrogen fuel cells are no longer a major part of the automaker’s plans for the future. Engineering news site Smart2Zero reports that Zetsche said declining battery costs have made fuel cell vehicles uncompetitive with electric cars. Hey, maybe I’m wrong here. Maybe this is a bad move by Daimler, prioritizing we-need-them-now-electrics over hydrogen in the future. Maybe. Somehow Tesla’s—ahem—troubled Fremont factory cranked out enough Model S and Xs to hit a new production record for the company (13,450 sedans and 11,550 minivans, respectively) along with a new quarterly sales record as well. Tesla shipped 25,000 cars in the first quarter of 2017. 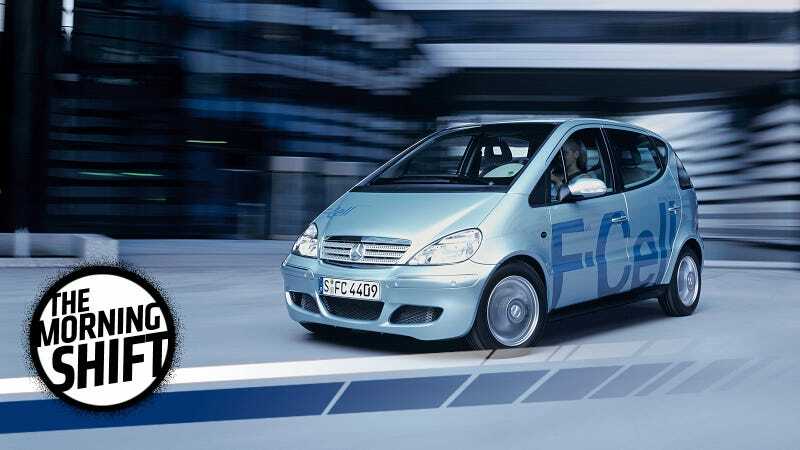 Still, it’s easy to see why Daimler is ditching fuel cells to speed up EV development, no? The demand for lidar has some customers waiting more than six months to get their orders filled, compared with a few weeks for delivery just a year ago. The Silicon Valley publication The Information reported in March that researchers at the University of Waterloo in Ontario had to put their self-driving car program on hold after its 5-year-old lidar broke, and the team was told by lidar manufacturer Velodyne that it would take six months to get a new one. Velodyne’s LiDAR shipments have tripled year over year, and it looks like new companies are going to have to pop up to meet our crushing desire for cars that let you safely text while you’re on the road. Recently German prosecutors in Bavaria (Would you ever see this in Volkswagen’s home state of Nidersachsen?) raided VW’s offices looking for Dieselgate docs. Volkswagen protested with an official complaint though, oddly, VW did not say what the complaint was exactly. [A] Munich local court has now decided that the raids by prosecutors on Jones Day as well as on VW and Audi, both of which were also searched separately on March 15, were legitimate, a court spokeswoman said on Monday. Munich prosecutors said the decision by the local court to reject VW’s complaint would also be checked by a Munich district court. Again, the future of clean cars is here, and it’s one that carmakers are fighting tooth and nail, cheating wherever they can get away with it. Who thought it would be squeaky clean and positive? Ford Motor Co is recalling about 52,600 F-250 pickup trucks sold in the United States and Canada because the vehicles could roll after the driver moves the automatic transmission lever into park position, the company said on Saturday. The day I trust carmakers to look into their hearts and, in a moment of piety and clarity, build cars that are clean and safe and well-built, is the day I die. This is why we have regulations. Neutral: The Car Of The Future Is Here. Is It How You Imagined? I can’t say I’m disappointed in how the future of cars has turned out. It’s just kind of funny to contrast it to how happily carmakers said they were getting into the business of a revolutionarily clean and advanced tomorrow. How did you envision the future of cars when you were growing up, and how has it turned out?